It’s something we skipped over during the craziness of the holidays, but in case you missed the news from Ted’s Take, the Mystics switched their colors for the upcoming season to the ever patriotic red, white and blue. Interestingly, the logo maintained its former configuration – this was really just a straight up color swap to get from the old teal/gold to this. 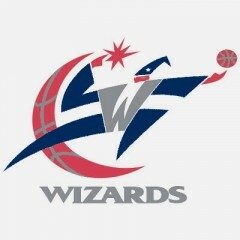 With this in mind, it’s worth remembering that it has been announced by Leonsis that the Wizards are going to follow suit and switch from the teal and gold (meaning all of Ted’s teams will be able to “Rock the Red,” among other things). I haven’t done nearly enough uniform editing as I have hockey rink moving, but I did try to follow the color replacement scheme that the Mystics did to create the above logo. Following this, what do we think will happen with the uniforms? The thing with DC teams is certainly becoming the prominence of the red, but on the court, the current designs may need more than a color swap to make that happen. The Bullets aren’t coming back, but I feel like we will need to see a logo and uniform refresh instead of just dropping in the red and blue. One creative individual has already thought of something (including stealing the Nats’ wordmark for Washington), but any other ideas?